DownWorld is a Flash-powered MMORPG, played in the browser. It features turn-based combat with a bejeweled twist. There are two classes, aptly named ‘caster’ and ‘breaker’. PvE gains experience and loot; PvP gains experience and ratings. What the game world lacks in story it makes up in social features and exploring -- the game world is quite sizable for a Flash game, and sports group combat for enhanced fun. 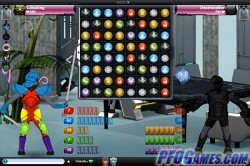 DownWorld is actually quite fun, if you fancy the idea of multiplayer bejeweled. It is worth mentioning that the crafting system is well-developed, too.